Willis Polk built mansions for William Bowers Bourn II, Harriet Pullman Carolan and other plutocrats of America'a First Gilded Age. 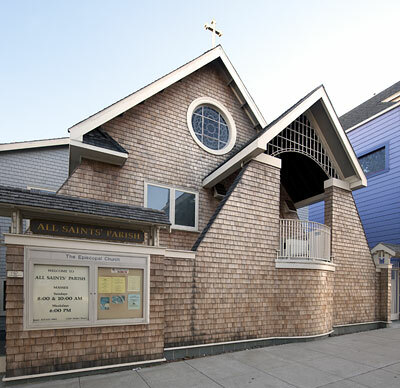 Polk could also work on a more modest scale as shown by his design for the All Saints' Episcopal Church in the Haight-Ashbury District. Willis Polk, the son of a carpenter architect, was born in Jacksonville, Illinois. He apprenticed to a carpenter when he was fourteen. At fifteen, he won a competition for the design of a six-room schoolhouse in Hope, Arkansas. In 1885, Willis and his father and his brother founded W. W. Polk & Sons in Kansas City. For several years, Polk traveled extensively and acquired experience working for many architects including Ernest Coxhead and A. Page Brown. In 1889, Polk joined the office of A. Page Brown and moved with Brown’s firm to San Francisco. After Polk's family moved to San Francisco in 1892, they formed the firm of Polk & Polk with Willis providing the creativity, Daniel doing the drafting, and their father supervising construction. During the 1890s, Polk produced unusually diverse architectonic forms, space, scale, and imagery. He drew from post-medieval vernacular sources and from classical schemes. In 1901 Polk and his wife moved to Chicago to work with Daniel H. Burnham who had inspired the American Renaissance known as the City Beautiful Movement. Burnham's firm had already designed two important building in San Francisco, the Chronicle Building in 1889 (San Francisco Landmark 243) and the Mills Building in 1890 (San Francisco Landmark 76). Polk returned to San Francisco in 1903 and worked with Burnham on a master plan for San Francisco following the precepts of the City Beautiful Movement. The 1906 Earthquake and Fire ended any hope of implementing the plan. Polk was placed in charge of Burnham's west coast office after the catastrophe. The association lasted until 1910 when Polk converted the office to his name. Polk and his partners completed more than one hundred major commercial buildings and residences in the Bay Area.